On Monday I posted this on e-readers for children. Now let me clarify, I have a Nook and I love it. However, before I got it, I wasn’t sure if the Nook and I would hit it off. 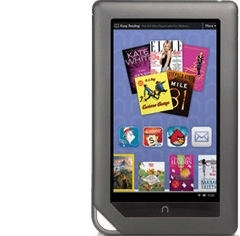 The Nook is cool, sleek and modern. I am old-fashioned. I like homemade comfort foods like soup, sauce and gravy. I like opening my gifts on Christmas morning, not Christmas Eve, and I like reading real books. I like the feel of a book in my hands, the smell of a book, (especially the smell of a library book which can bring me back to childhood) and I like the tactile sensation of turning pages. How then, could the Nook and I make it work? And, if I were going over to the dark side of digital reading, what should I wear? Would I have to give up my sweaters and pearls and wear something edgier, perhaps head to toe black like Darth Vader, cat burglars and intellectuals from SoHo? And of course there was the bigger dilemma, if I were going leave my tried and true traditional books, what should be the first title I read on the Nook? Should I go with a classic like Pride and Prejudice? Would a beloved favorite like The Great Gatsby be a digital disappointment? Finally, since I felt like I was doing something seedy anyway, I settled on an easy beach read called Trouble in Mudbug, in which the protagonist’s manipulative, materialistic mother-in-law finally dies only to come back and haunt her. And you know what, I kind of liked it. The Nook and I didn’t really bond though, until a trip to Montauk. There we spent time on the beach, on the balcony, and curled up on the couch together. I discovered that the Nook is more than just cool; it is also the perfect travel accessory. It provides a world of reading in one compact case that easily fits into an overnight bag. So now I’m asking, why would anyone leave their tried and true traditional Nook for Nook Color?